This is an index of my writing on the 2016 Vancouver International Film Festival. I’ll be back at the Vancouver International Film Festival this year, and we’re planning extensive coverage over at Seattle Screen Scene. This year’s lineup looks like it might be the best since 2012, packed with promising European titles, the best selection of Asian films on the North American festival circuit and a renewed emphasis on cutting-edge Canadian cinema. All of my reviews this year are going to be over at SSS, but I’ll have an additional index of them over here, and I figured this would be a more appropriate home for my proposed schedule. These are the films I’m hoping to see. Showings that conflict with each other are listed without a space in-between, with the film I’m leaning toward attending listed first. If you wanted to design to film perfectly and specifically for me, it would probably be something like The Assassin. A film by my favorite contemporary filmmaker, one from whom I spent months earlier this year studying and writing about in detail for a theatrical retrospective, working in one of my favorite film genres, the one I’ve spent the better part of the last three years exploring. There was simply no way this wasn’t going to be a movie I liked. But since whether a critic likes a film or not is easily the least interesting aspect of any decent review, thankfully that task is quickly disposed with and we can proceed to more interesting concerns, the what and why of the film. 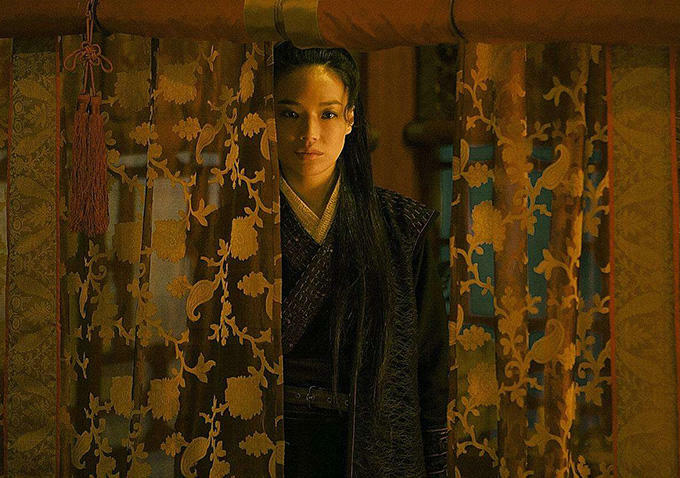 Hou Hsiao-hsien’s latest, his first film since 2007’s Flight of the Red Balloon, is set in the late Tang Dynasty period, starring Shu Qi as a young woman who returns home after ten years as a killer-in-training to wreak vengeance on the local ruler. The film follows a typical wuxia plot structure, with motivations gradually revealed and complicated, schemes exposed, punctuated by regularly occurring fight sequence set-pieces. But Hou has adapted that structure to his own unique rhythm, presenting a languid, patient narrative of long takes exploring lush sets and landscapes. It’s the stillest action movie there’s ever been. In tone the closest analogue in Hou’s previous work might be Millennium Mambo, a hypnotic film that could seemingly spin on forever. Right up until the director’s credit came on screen, I kept expecting another hour of narrative. I had no idea how much time was passing, or what the shape of the story was, until it ended. This is one of the distinct pleasures of some of Hou’s best work, from The Time to Live, The Time to Die to Goodbye South Goodbye to Flight of the Red Balloon. Looked at in total, however, the plot could easily be that of a late 70s Chor Yuen film (but not at all a Chang Cheh film, for a number of reasons, the gender of the protagonist and the ultimate optimism of the work first among them). It’s just that Hou refuses to match the pace of the film to the complexity of the story. He teases out exposition in long dialogue scenes, but shoots those scenes with such intricate beauty that it’s hard to pay attention to the words being spoken when the pictures are so fascinating. 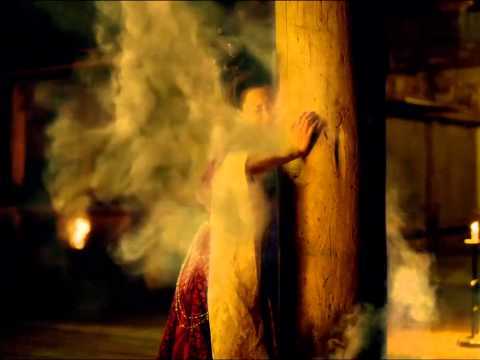 An example: a long, central scene between Chang Chen’s governor (the target of the assassination plot) and his favorite concubine explains much of the Shu Qi character’s past and the volatile tangle of competing interests that lead to his family breaking off Chang’s engagement with Shu in favor of another woman, a humiliation which lead to Shu’s exile. It also demonstrates the bond between Chang and the concubine, which motivates a further complication in the plot, as Chang’s wife has a murderous scheme of her own. But rather than the actors, who form a loving triangle in the center middle distance of the frame and remain mostly still, our eye is drawn to the edges of the frame. The left is dominated by a line of three flames, reflections of candle lights that appear to have no on-screen referent; the right by a curtain that billows in and out throughout the scene, blown by a similarly unsourced wind, shrouding the actors in gauze when it blows in, revealing them in crystal clarity when it blows out. You get so lost in the image, it’s easy to miss the thread of the plot. But plot there is (this is not, as my pal Neil so tweeted, a film “about a bunch of veils and curtains”). Hou’s films, from The Boys from Fengkuei on, have a distinctly languid place, regardless of how much actually occurs in the narrative. Flowers of Shanghai is an opium dream of a film, one in which there’s almost no dramatic action, a fair amount in dialogue and a torrent of emotional churning under the surface. A City of Sadness is a multi-layered, multi-character historical epic. Millennium Mambo and The Puppetmaster are narrated tales, one about the entropic life of a club girl in modern Taipei, the other a 50 year biopic about a man caught up in the sweep of history. In mood and pace the films are the same, with long single take scenes of apparently mundane and occasionally inexplicable behavior drawing us into the feel of the protagonists’ world, an effect amplified by the highly subjective nature of the narration. That subjectivity is the essential element in all of Hou’s films, as he is ever seeking to capture an individual’s experience of the world, and to inspire a deep empathy in the audience. His films eliminate any sense of moral judgment: whatever bad or dumb things his heroes may do, he doesn’t allow us any distance from them. We are inside them, left to understand their lives as they do. The Assassin is no different in this respect. Its dense plot of maneuvering factions in the present inspired by the secret schemes of the past is revealed slowly, like Flowers almost entirely in dialogue. Our identification with Shu Qi’s hero is established in a new way, however. Rather than linger over lengthy shots of Shu at work or in repose, as in Mambo, we instead observe things as she is observing them. Not strictly from her point of view, but often Hou will show us a long scene of character interaction only to cut at the end to Shu observing silently from some hiding spot (invisibly ninja-style in the rafters, for example). Her motivations remain opaque through the length of the film, right up until the very end we don’t really know what she wants or how she plans to go about achieving it. Of course, when that “Directed By” credit does appear on-screen, everything makes perfect sense. What she ends up achieving is a bold rejection of the traditional wuxia narrative, the first major development in the genre in decades. 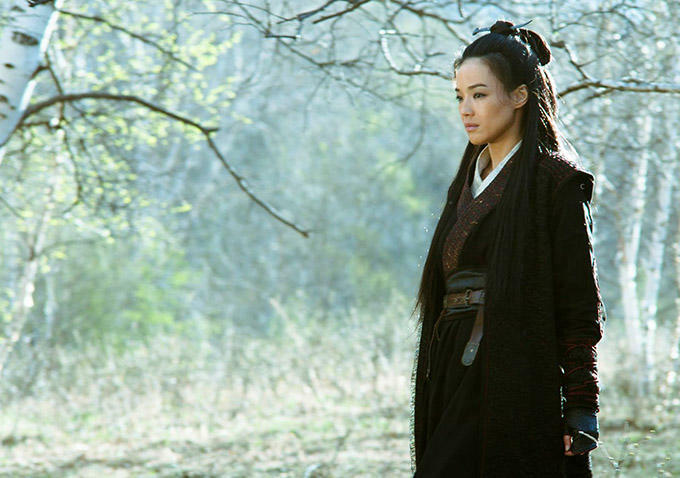 This century’s art house wuxia films have all taken the form of homage, usually to King Hu. A mix of spectacular and (more importantly perhaps) spectacularly shot action with a bit of Buddhism and above all a devotion to a code of honor that demands personal unhappiness, films like Crouching Tiger Hidden Dragon, House of Flying Daggers and The Grandmaster follow the strictly established rules of the genre, which itself is as old as cinema and reaches back through centuries of Chinese literature. For all their technical facility, they remain merely highly polished variations on Hu’s work from the 1970s, while lacking the sense of experimentation that makes films like A Touch of Zen or Legend of the Mountain so unfathomable to this day. There hasn’t really been anything new in the genre since Hu’s titanic pair of of Legend of the Mountain and Raining in the Mountain in 1979. That is, until now (unless you count Tsui Hark’s various variations on the genre, which add to the traditional form outlandish special effects, breath-taking speed and an anarchic wit. At their core, though, they’re still traditional narratives). Obviously in adapting his highly idiosyncratic style to the genre, Hou was bound to come up with something interesting. But I’m surprised at how much he actually bent his career-long aesthetic. In The Assassin, Hou cuts within a scene, he uses different film stocks and aspect ratios (it’s all in the archaic 1.33 ratio (which emphasizes the verticality of traditional Chinese painting, the influence of which is felt strongly in the landscape scenes, aided immeasurably by the natural beauty of China’s landscapes and fortuitous fogs rolling in to mimic the vast negative spaces so distinctive in that art form), like last year’s Horse Money and Jauja, but for two flashback shots, on slightly grainier film stock, which are 1.85, possibly to accommodate the shape of a long musical instrument), he has insert shots, and the camera moves into the frame, all techniques he’d abandoned 30 years ago when he moved from mainstream romantic comedies into art house minimalism. But as the demands of wuxia changed Hou, so did Hou change wuxia. There are fight scenes in The Assassin, but they are quick. Elegant and brief, they are over before the heroes of a Lau Kar-leung film would be even a little bit warmed-up. 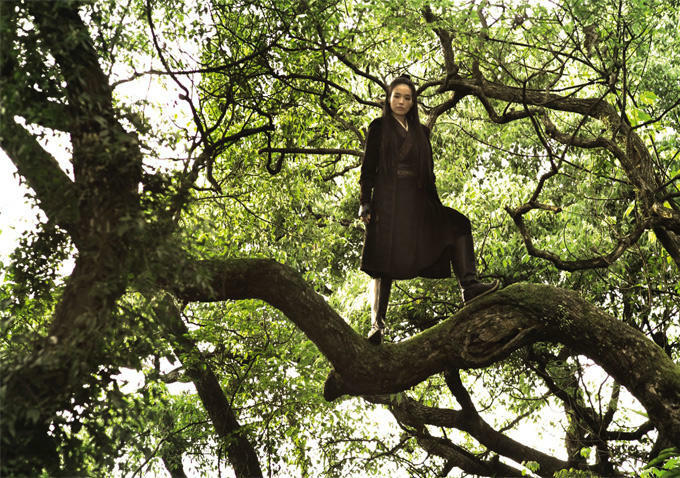 The de-emphasis on action is vital: Shu Qi is an assassin who rejects assassination, a wuxia knight-errant who rejects the world of violence, the jianghu. She rejects everything that defines a wuxia hero: the whole Confucian edifice of blind obedience to ones master, of defining honor as the strict following of a code that has little to do with morality or even common sense, the reification of abstract concepts over basic human happiness (the film also enacts a recurring opposition in Hou’s work, that of the country and city, as Shu leaves the lushly ornate interiors of imperial life for the rough open skies of the country and an itinerant village existence). The fact that she’s a woman isn’t especially unusual, there have been female warriors in wuxia stories for centuries, and they’ve been consistently represented on-screen. But usually they behave exactly the same as the male characters, while occasionally falling victim to romantic desires as well. Shu avoids the tragic fate of a Zhang Ziyi character by doing something Zhang never could, despite the obvious evils or inhumanity of her various masters. Shu, in explicitly rejecting everything the wuxia ethos stands for, turns the wuxia hero from a tragic figure into a truly inspirational one. She’s the first one I’ve ever seen that actually succeeds in reinventing the world, in making it a more perfect place. The Forbidden Room, Miguel Gomes’s Arabian Nights, Thom Andersen’s The Thoughts That Once We Had, Luo Li’s Li Wen at East Lake, Lee Kwangkuk’s A Matter of Interpretation and Philip Yung’s Port of Call. I might write about some of those here as well, but for now I’m just going to attempt to cover some of the films we didn’t get to on the show. Unbelievably, despite having just finished watching it a mere 90 minutes before we began recording, both of us neglected to talk about Hong Sangsoo’s latest release, one of our most-anticipated films of the festival. The Hong film is a perennial highlight of every VIFF (I’ve seen Like You Know it All, Oki’s Movie, Hahaha, In Another Country, Our Sunhi and Hill of Freedom here over the years) and Right Now, Wrong Then is no disappointment. It’s a very good film, while lacking the formal experimentation that distinguishes his best work (Oki’s Movie, The Day He Arrives) or the sheer giddy pleasure of his funniest movies (Hill of Freedom, In Another Country), it has a precision and focus that assures that, despite a certain conventionality, it will become one of his more popular features. Split evenly in two halves, it follows a film director, in town for a festival showing and Q & A, as he wanders about a tourist site where he meets a young woman. They talk, drink soju, make awkward approaches at romance and ultimately split when the director is proven to be a dishonest, womanizing lout. Then the film resets, complete with a new title card (the first half is “Right Then, Wrong Now”, the second “Right Now, Wrong Then”) and we replay the same day but with significant differences. The director in this version is honest and open (perhaps to a fault, as when a drunken overheating compels him to strip naked in front of his companions). Hong significantly varies his camera setups in the second section, creating more balanced compositions where in the first half the setups tended to privilege the director’s perspective (including a Hong rarity: an actual POV shot). It’s a mature film, relaxed and confident with a simple truth to tell. But underlying it all is a palpable loneliness. It’s played as sadness, as tragedy, in the first half, where the director’s faults lead to failure and angry isolation, and as wistful melancholy in the second, where people can find happiness in connecting with an other, with the full knowledge that any such connection is necessarily temporary. It’s a quiet and sweet film, a warm room on a cold night, and vice versa. We talked a bit about Port of Call on the podcast, but I didn’t mention one idea I had about the film, which is that it’s a kind of update/companion to Peter Chan’s 1996 masterpiece Comrades, Almost a Love Story. In that film, Maggie Cheung plays a woman who immigrates from the Mainland to Hong Kong, works a number of jobs to survive (including at a local McDonald’s), has a deep connection with a character played by a major pop star (Leon Lai) with whom she bonds over a shared love of another pop star, Teresa Teng, and falls in with a big guy, a man of violence who loves her and takes care of her. In Port of Call, Jessie Li plays a woman who immigrates from the Mainland to Hong Kong, works a variety of jobs to survive (including at a local McDonald’s), has a deep connection with a character played by a major pop star (Aaron Kwok – though the two characters never meet, of course, their relationship, or rather, his with her, is the defining element of the film), and is obsessed with another pop star (Sammi Cheng). She too falls in with a bad crowd, and her relationship with a large man capable of violence leads to her doom. Chan’s film is one of nostalgia, with Hong Kong as an aspirational place of freedom and opportunity, where one can move, work hard and eventually make it big (and then, prior to the Handover, make it to America). Its characters look backwards to their home villages, with Teng’s music as the aching symbol of the world they left behind. Yung’s is a film of horror, based on true events that occurred in the 2008-2010 period, the Hong Kong it finds is no longer one of hope, but of desperation, with the poor set upon each other in twisted games of manipulation and violence, where even a glimmer of a true connection (facilitated by an internet chat) can lead to disaster. Cheng’s music is the aspiration, it’s what Li and her sister listened to when they were trying to learn Cantonese, it’s the music of hope amid failure. Yung set the film in the recent past, as much because that’s the time when the actual events occurred as because given the pace of change in China, the situation has already shifted dramatically. In his Q & A, he suggested that economic conditions have balanced so much between Hong Kong and the Mainland’s urban centers, that such aspirational immigration is far less common (in fact, he points out that even in 2008, the dream of moving to Hong Kong was Li’s mother’s dream, the younger generation doesn’t look at the former colony in the same way). But there’s nothing particularly unique about the idealization of Hong Kong. If the Mainland is catching up with or even surpassing it in the realm of fantasy-creation, there will always be a disconnection between that dream, say the candy-colored consumer paradise of Go Away Mr. Tumor, and the gruesome reality of the poor folks who fall into nightmare. Emily Ting’s It’s Already Tomorrow in Hong Kong is a different kind of fantasy, one of ex-patriates in Hong Kong and, more distressingly, of indie filmmakers weaned on Before Sunrise. Jamie Chung plays an American from Los Angeles (her grandparents emigrated from Hong Kong) lost in the city who runs into a fellow American named Josh. He’s the Joshiest Josh in film history, working in finance but really, an aspiring novelist. Actor Bryan Greenberg looks like the child of Michael Rappaport and John Krasczinski, but with even worse hair than that implies. He shows her around, lets slip way too late in the evening that he has a girlfriend and the couple splits. . . only to reunite a year later for another walk (once again hitting places best seen in Wong Kar-wai and Johnnie To films) and faux-naturalistic conversation (and a trip to a bar to see a Hong Kong knock-off of Arcade Fire, which is exactly as appalling as that sounds). After a century of Parisian dominance, it’s clear to me that Hong Kong is the most cinematic city in the world, and it certainly doesn’t let Ting down. The film is gorgeous, the bright lights of Hong Kong providing enough inherent pleasure that one is able to overlook the constructed obviousness of the script and the bland nothingness that is Greenberg’s performance. Chung fares better, her lines are just as generic but she sells them with big eyes and a world-saving smile. Pretty as the city is, it’s a problem when during the romantic climax of your film, the most interesting thing on screen is the multi-layered play of lights on a taxi cab window. Not even a cameo from the great Richard Ng can bring it to life. A vastly more successful Hong Kong romance comes from the team of Mabel Cheung and Alex Law (she directs, he produces, they both write). Based on the life of Jackie Chan’s parents (though the story ends long before he was born) A Tale of Three Cities stars Tang Wei and Lau Ching-wan (weirdly billed as “Sean Lau”, which I haven’t seen him marketed as in years, a sign perhaps that the film is trying for a North American release) as a couple kept desperately apart by war (first against the Japanese, then against the Communists). In a Brady Bunch-like set-up, Tang has two young daughters and a husband she didn’t care for who gets killed by a clock during an air raid, while Lau has two sons and a wife dying of some unknown disease. They meet when, in the course of his duty as a Nationalist soldier, he catches her smuggling opium and lets her go. It turns out she’s his wife’s cousin and they meet up again when the war forces them from Shanghai to the smaller town of Anhui. He’s loud, illiterate and usually drunk, she’s quiet, refined and very smart. Of course they fall in love, but first the war (Lau is captured by the Japanese) and then family keep them apart (Tang’s mother doesn’t think he’s classy enough for her girl). The performances of the two leads are exceptional, Lau playing a typical role for him: a hard man with soft eyes. Tang though, is proving herself to simply be one of the best actors in the world right now. Last year at VIFF she carried Ann Hui’s biopic The Golden Era (set during the same period, but much more experimental in style and tone) with a finely modulating performance as a psychologically unstable writer. Already in 2015 she’s been brilliant in a nearly a wordless performance in Michael Mann’s Blackhat and as the emotionally explosive center of Johnnie To’s musical Office. Her performance here is halfway between those two, with simple eye movements and precise gestures, she is curiosity and determination in the interior scenes, and in the many scenes of disaster she is broad and heart-wrenching, an expressive anguish that goes beyond melodrama. The film is a series of brief unions and long separations, as the two find themselves apart from each other and their children for increasingly long periods of time, mirroring the coming together and tearing apart of the nation itself. Cheung expertly keeps things focused, despite the leaps in time and location, and the film is a masterpiece of classical storytelling, the kind of lush historical romantic epic that Hollywood hasn’t managed to make in almost 20 years (Titanic is the last good one I can think of). Along with another such epic, 2014’s The Crossing Part One, directed by John Woo, it’s clear that these veterans of the Hong Kong film industry have once again bested Hollywood at its own game. This is an index of my coverage of the 2015 Vancouver International Film Festival. Also be sure to check out the coverage we did over at Seattle Screen Scene. Amid the Very Important Films tackling Very Important Subjects in Very Important Styles at this year’s festival, there is, as there always is here in Vancouver, a place as well for more generically-oriented fare. I’m not speaking of the always-fecund indie-horror/thriller genre, which too is well-represented and well-attended, despite my almost total absence, but rather that most-reviled of all contemporary genres: the romantic comedy. Burdened by 15, 20, 40, 70? years of spunky professional heroines cursed with the twin scourges of awkwardness and beauty-concealing eyewear; bland, square-jawed leading men with suspiciously nice hair; meets cute, stirring declarations and string-swelling finales; the romantic comedy remains among the most formulaic, irritating, disreputable and wildly popular of all film genres. But as these things always go, along with the successful trash there are every year great gems to be found, too special for the mainstream, their denominators not low enough for wide release in America’s multiplexes. Films that persist despite all the odds in exploring the promise of this ancient and enduring form. At the top of the list of the best modern romantic comedies are the films of Hong Sangsoo, an annual denizen of the VIFF schedule (this is the 7th of his films I’ve seen here in Vancouver) and his latest, Hill of Freedom continues his winning streak with no end in sight (he’s managed an unbroken string of masterpieces with nine films since 2008’s Night and Day). Hill of Freedom returns, after a three film sojourn in the point of view of female protagonists, to the male perspective, in the person of Mori, a Japanese man in Korea to look for a woman, Kwon, whom he has decided he is in love with because she is the best person he has ever known (he respects her so much! A sentiment interchangeable with love in the recent films). The bulk of the story is relayed in a series of letters (memento mori?) Mori wrote to Kwon after he was unable to find her, his voiceover narration guiding us through the requisite drinking bouts, awkward social encounters and questionable life choices. One of Hong’s funniest films, my notes are mostly just pages and pages of dialogue as I furiously transcribed at least half the script. Formally there is at least one development in Hong’s repertoire: for the first time that I can recall, Hong uses a dissolve. It’s a quick one, eliding a moment within a scene (early on, when Kwon accidentally drops the letters on a stairwell and scurries to pick them up, with disastrous consequences for the temporal continuity of the rest of the film). And of the three big drinking scenes, only one is in the standard Hong shot, parallel to the table with the actors arranged perpendicularly, facing each other. The other two table scenes are angled off to the side, privileging one of the drinkers over the others (this is a return for Hong rather than a new approach, Virgin Stripped Bare By Her Bachelors uses the same setup, among other earlier films). 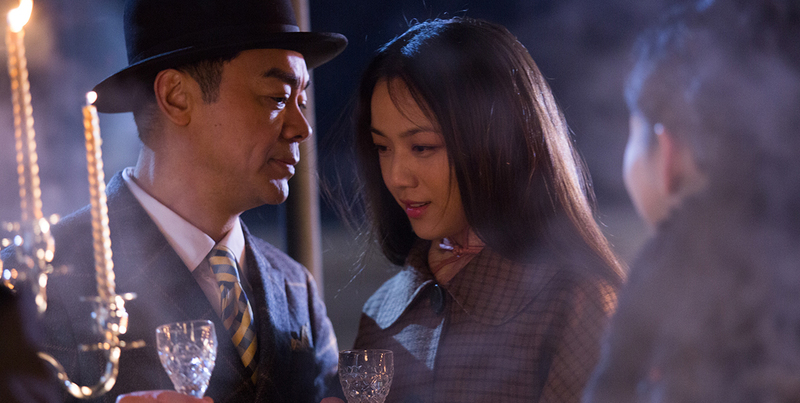 Unusually, none of the characters are specifically stated to be in the film or film teaching business, although Mori is told that he “has the fine mustache of an artist”. As sweet and warm as anything Hong has yet made, but with a dark cloud of instability under its fragile reality. The dreams and fantasies of Night and Day and Nobody’s Daughter Haewon and the scripts of In Another Country, along with the temporal loops of The Day He Arrives and Oki’s Movie (to say nothing of the manifold points of view in Hahaha and Our Sunhi), give the recent films a slippery, kaleidoscopic quality. I experienced Hill of Freedom as ending happily, but looking back on it, I’m not so sure that’s what really happened. Moving from one of our most-established auteurs to one of our newest, the most-underrated film of the festival thus far has got to be Heiward Mak’s Uncertain Relationships Society. This is the fourth feature by the Hong Kong director (in addition to writing her own films, she also co-wrote Love in a Puff, itself one of the great romantic comedies of the last decade, with its director Edmund Pang Ho-cheung), though she remains largely unknown outside of Hong Kong as far as I can tell (she doesn’t even have a wikipedia entry). In preparation for this festival, I sought out her earlier film Ex, from 2010, which my wife and I both really enjoyed (“I like her. She’s honest.” pronouces the wife). Ex followed a pair of couples from a chance encounter at the airport. One woman breaks up with her boyfriend and goes off with the other couple, the man being her own ex-boyfriend. She stays with them for awhile, while remembering her previous relationship with the man, her boyfriends after the original break up, and her meeting and falling in love with this latest boyfriend. We experience it all in a series of non-linear flashbacks, usually from the woman’s point of view but not exclusively. In the end, the film becomes less a love story than a coming of age tale, as the woman begins to assert her independence from romantic influence and sets out into the world anew. Uncertain Relationships Society works almost exactly the same way, except with approximately three times as many characters and an even more densely-packed flashback structure. We follow the characters from their last year of high school (2008) through the present, as the cast of mostly unknown actors grows up, at least a little bit. Each character is in love with someone who doesn’t quite love them back, while each is also loved by someone they don’t quite love in the same way. It’s a dizzying concept that Mak handles so naturally that the transitions and leaps in time and space and relationship always remain emotionally clear. In its leap from the particular to the expansively general, it reminded me of no less than the jump from Lola to Young Girls of Rochefort, to make a hyperbolic comparison. Looking at Mak’s credits, I’m curious just how involved she was in Love in a Puff, which strikes me as significantly better than its sequel, Love in the Buff, which is credited to Pang and Luk Yee-sum. Mak gives us all the required elements of the romantic comedy, the declarations, the panic, the heartbreak and triumph, but with an intelligence and, yes dear, honesty that’s hard to find in America these days. In many ways it feels more like a TV series than a movie, and I don’t mean that as a negative. It’s beautifully shot, the colors of Hong Kong as vibrant as ever (I’m still stunned she found a way to make the very familiar Hong Kong airport seem completely fresh in Ex), with the off-hand virtuosity which that most-photogenic city inspires apparent in every frame. She keeps her spaces stable and coherent, knowing just when to move in for a closer, more intimate effect (an early scene in a recording studio, a man and woman singing a terrible jingle for lemon juice, his voice in her ears as she stands at the microphone is as charged as anything I’ve seen this year). Rather, her story has the depth and resonance of a full season of very good TV, with at least eight fully-realized individual characters and enough story to fill 20 hours with ease. That she packs it all into a mere 118 minutes (there are two other versions, this length is her preferred “director’s cut”) is nothing short of remarkable. French director Axelle Ropert’s second feature, the hideously named Miss and the Doctors (everyone agrees the original title, Tirez la langue, mademoiselle (or, Stick Out Your Tongue, Miss) is vastly superior), tackles the equally complicated subject of the love lives of the middle-aged. The doctors are brothers, general practitioners in Paris. They each fall in love with a younger woman, the mother of one of their child patients. The woman, a beautiful bartendress (Louise Bourgoin), is estranged from the girl’s father, and at first resists the advances of both brothers. The older, taller brother, gruff and blunt, is played by Cédric Kahn, the younger, a blond recovering alcoholic who looks a bit like a Gallic Michael J. Fox, is played by Laurent Stocker (billed as being “from the Comédie-Française”). It’s a sweetly patient, funny and melancholy story. One of those movies where everyone has their reasons. Alex Ross Perry’s Listen Up Philip, on the other hand, is as self-lacerating a tale of artistic ego and male self-importance as I’ve seen in quite awhile. 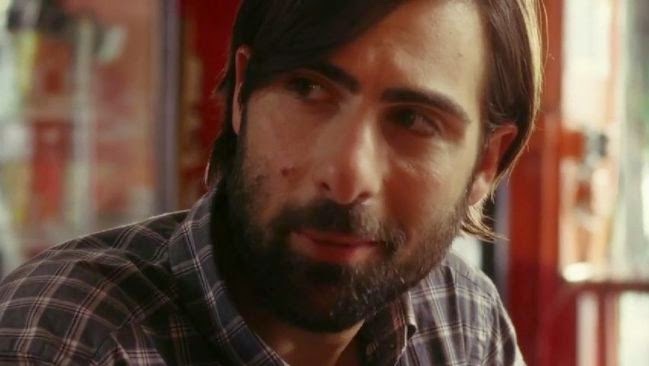 Trapped for the first third in the insufferable mind of young author Jason Schwartzman, the eponymous Philip, as his hilarious misanthropy turns increasingly cruel, we’re given a reprieve in the film’s middle section, as Philip’s now ex-girlfriend Ashley (Elizabeth Moss) reconstructs her life in fits and starts after their breakup. The last section of the film finds us back with Philip and his mentor, legendary author Ike, played with gruff arrogance by Jonathan Pryce. Like his previous feature, The Color Wheel, Perry delights in the us-against-the-world egotism of his protagonists, drawing pleasure in the absurdity of the difference between how they see themselves and how the world sees them. It would be unbearable if he didn’t care just enough about these terrible people to laugh a little bit with them, and give them an ever-so-slight chance of happiness, however perverted the manifestation of that happiness might be. Unlike The Color Wheel‘s gorgeously grainy black and white, the new film is in color, vibrant and warm. However, also unlike the previous film, it’s shot in a nauseatingly close-up hand-held style. The choice makes more sense here than in something like, say, Humpday, thanks to a voice-over narration (delivered by no less than Eric Bogosian) that frames the film as a quasi-documentary. I’ll readily admit my distaste for this style has as much to do with my own middle-age and tendency toward motion sickness. Suffice it to say I’d prefer it if Perry and his accomplished cinematographer Sean Price Williams would take a step or two back from the characters. But whatever, there’s lots of ways to make movies. This is an index of my coverage of the 2014 Vancouver International Film Festival.